Step-1 Create the java project. Create the java project by File Menu - New - project - java project . Now specify the project name e.g. DemoHb then next - finish . 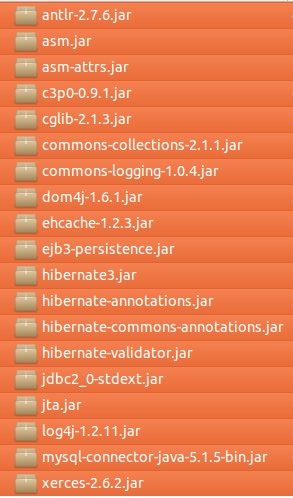 Step-2 Add jar files in your class path for hibernate. To add the jar files Right click on your project - Build path - Add external archives. and select all the jar files as shown in the image given below then click ok button . you can download library from given link..
To create the persistent class, Right click on src - New - Class - specify the class with package name (e.g. com.demo.vivekdemo) click finish button. Create the mapping file, Right click on src - new - file - specify the file name (e.g. employee.hbm.xml) click ok. It must be outside the package. The configuration file contains all the information for the datbase such as connection_url, driver_class, username, password etc. The hbm2ddl.auto property is used to create the table in the database automatically. To create the configuration file, right click on src - new - file. Now specify the configuration file name (e.g. hibernate.cfg.xml) click ok button. In this class, we are simply storing the employee object to the database. vivekraicdac@2012. Simple theme. Powered by Blogger.